iPad users, rejoice! We are thrilled to announce that the Fluxiom Uploader works nicely on iOS 6. On the uploader page, tap the +Add Files button to bring up a native pop-over with direct access to your albums and camera roll. From there, you can select as many images or videos as you want and upload them straight to Fluxiom in a single go. Once uploaded, you can use your files as you normally would with Fluxiom: share them, add them to Stages, etc. The full Fluxiom web application works beautifully on the iPad. We cannot wait to hear about the great things you share on the go with Fluxiom on iOS 6. Drop us a line and let us know! 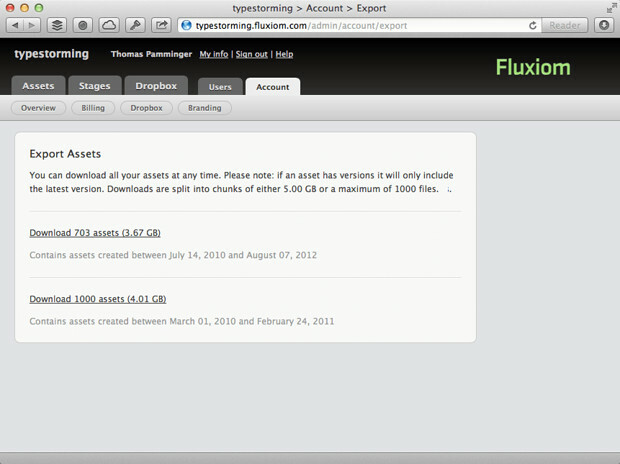 Fluxiom never locks you in: our data export feature enables you to download the last version of all your stored assets at the click of a button. Whatever you sent us we send you back, in a ZIP archive. There are no proprietary formats and no sneaky exceptions. Now that Fluxiom allows you to store tremendous amounts of data in the cloud, these archives sometimes grow extremely large. Once in a while, they get so large that browsers and routers can choke on them mid-way, forcing you to re-start the complete lengthy download a few times, until it goes through. Obviously, this goes against our « easy out » policy. This is why today we have pushed an updated, improved export feature. There is only one change: instead of sending you one potentially huge ZIP archive, we break your data down into chunks of 5 GB (about one DVD) or 1000 files. Each chunk gets its own archive, which you can download separately from the rest. There are no other changes, and the export feature is still as complete, as fast and as freely available as it has always been. We hope this tweak makes your life simpler, and look forward to hearing your feedback. Fluxiom is a wonderful way to avoid email overload, especially when collaborating with others. Email is still part of the experience, though, when it makes the most sense: we mail links and updates to your contacts on your behalf to make sure they see them, and we sometimes need to get rapidly in touch with you about invoices, service updates and account configuration changes. You might have noticed that, once in a blue moon, Fluxiom emails can get caught in SPAM filters. As SPAM levels rise on the Internet, email administrators require increasingly complex authentication measures: the burden is on us to prove we are good guys. To that effect, we have now switched to a vastly improved email delivery system, that turns all the authentication knobs to eleven. Rest assured no action is required on your part. Our emails should now reach you faster, and even fewer will be erroneously marked as SPAM. Going forward, our administrators will also be able to collect global filtering data, and will tweak content or formatting to further improve delivery. As always, please let us know if you, or anybody you share files with, experience any issues with Fluxiom emails. We are committed to continuously improving and streamlining your experience with the application, and that extends to every single message we send.